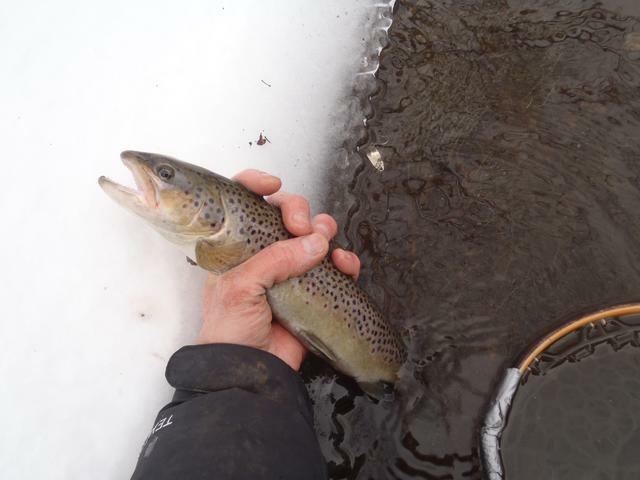 Before 2010, most of my winter fishing was through the ice. I had an occasional open water trip to switch things up. In recent years, my focus has totally switched and I'm fishing open water way more than I cut holes in the ice. At first, it was a novelty and I would catch a fish or 2 a month just to keep an open water streak going. 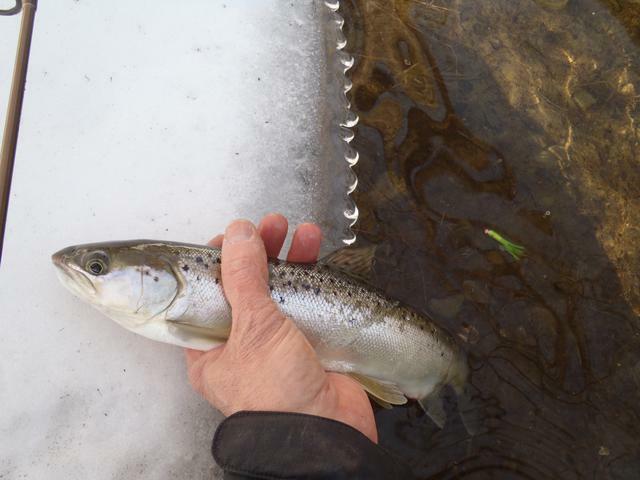 It's gotten to the point now, however, where open water almost always produces far better fishing for me than ice. I rarely feel an urge to venture on to hard water. January was no exception. 7 of my 9 outings were on open water. I came up with trout or salmon on all those soft water trips. Unlike a few years back, it wasn't just a fish here and there. Over those 7 trips I averaged nearly 6 fish per trip. I'll take those stats anytime! Not all open water days are created equal, and January was highlighted by an 11 fish day on the 10th. 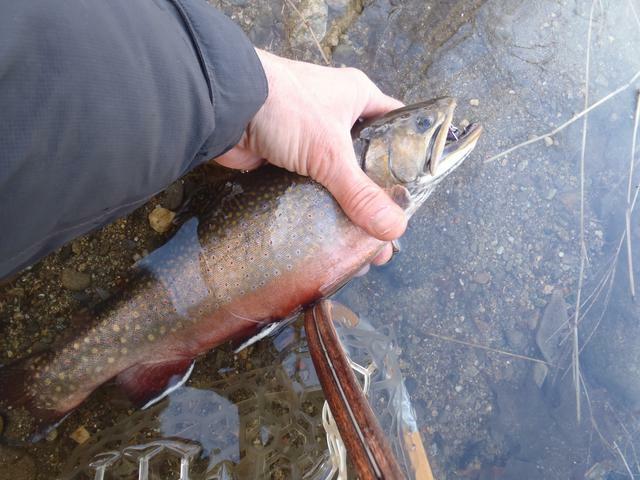 That day was heavy on the brookies, but no complaints. This day had a common denominator with a number of other days that also had fast action. I was on the water as a strong cold front approached and then blew through. Another pattern also emerged. The fish were most aggressive as the front moved over the area. In spite of 32* water, they would charge spoons like it was October. Then as the front passed, but clouds still dominated, they favored a tube jig retrieved with jerks and hops. 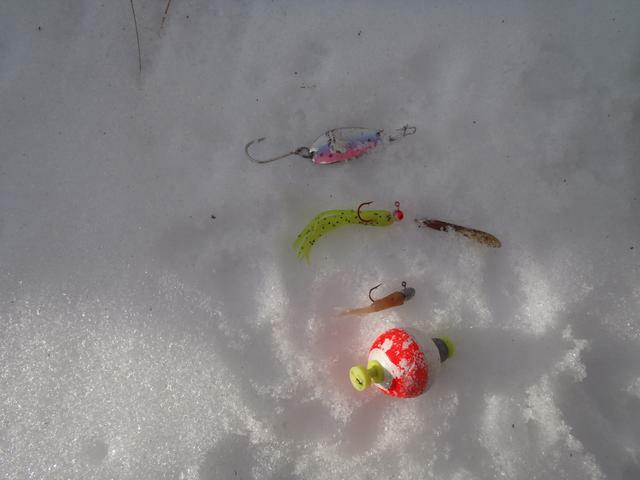 Once the sky cleared, the cold air settled in, and guide ice started to form, I had to go to a micro jig under a bobber to tease up a few more bites. Here is a typical progression. For size comparison, the bobber has a 1" diameter. January sure had a batch of changes in the weather, but every shift in gears presented opportunities. While strong cold fronts were good, the first warmer day after a cold spell would also produce. 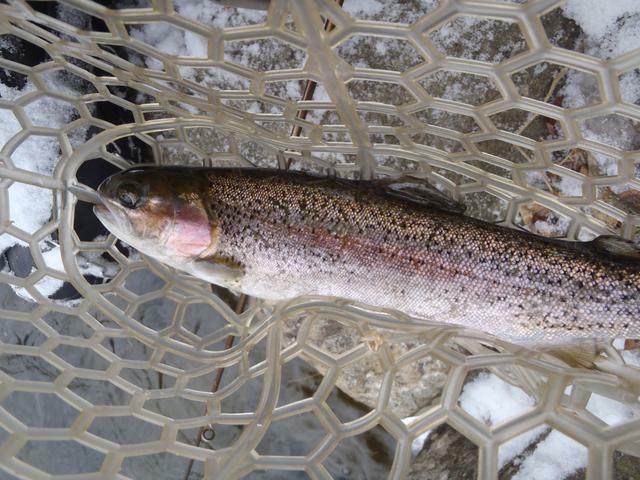 The fishing also got a big shot in the arm during the last week when deep snow was followed 2 inches of rain. 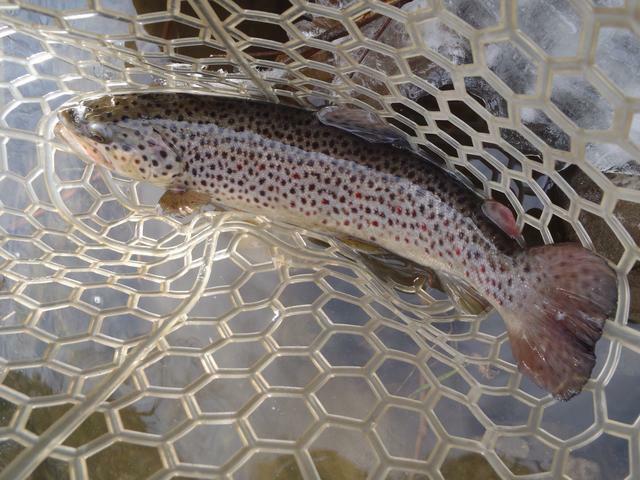 Flows bumped and salmon and browns came out to play in nice numbers, with the brookies still hanging around. 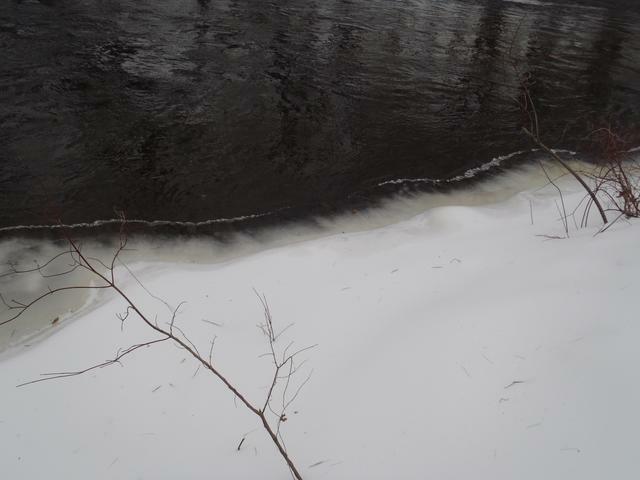 Even with the thaw, the few shards of ice floating around this salmon is the most I saw in terms of the dreaded "slush". Multiple year classes of salmon joined the fun. I found this interesting, since these fish are miles from what is their most likely stocking point. 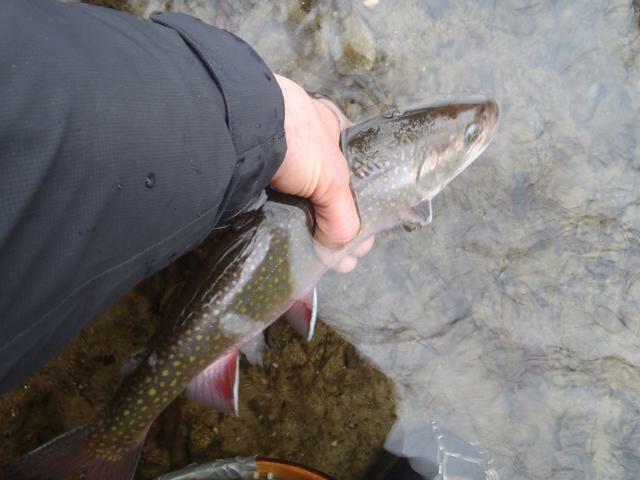 The browns weren't big, but I enjoyed getting into them and liked their colors. I managed to set up a pretty reliable spot rotation. If one didn't kick out fish, saving gas was not the main objective. At the same time, if I rarely left fish to look for fish. There were exceptions late month when I sought out variety. One late day spot change put a rainbow in the books. With the 'bow in hand, I got a wild hair to look for a togue and a splake to put me into "hat trick times 2" territory. I only know a couple spots where this is a slight possibility in winter open water. I tried, but found no love. Great pictures and write-up. Thanks for sharing! X2 Great read, and nice variety! 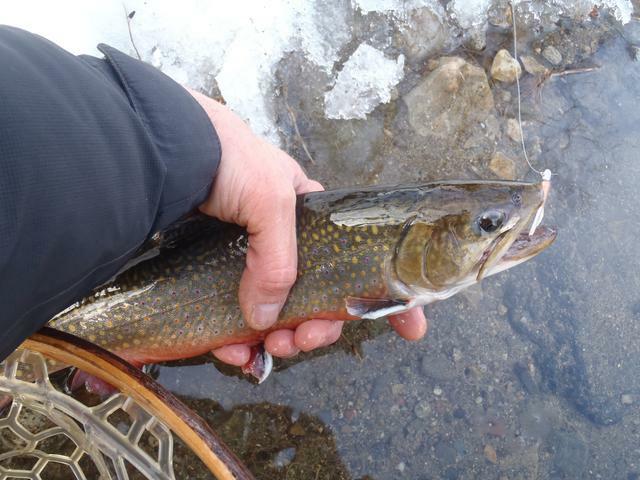 It would be really neat to get an open water lake trout this time of year! Great read and educational. Thanks Jim. Lake trout used to be my "bread and butter" winter fish shorecasting Lake Ontario and the Niagara R. when I lived out that way. Big time fun. 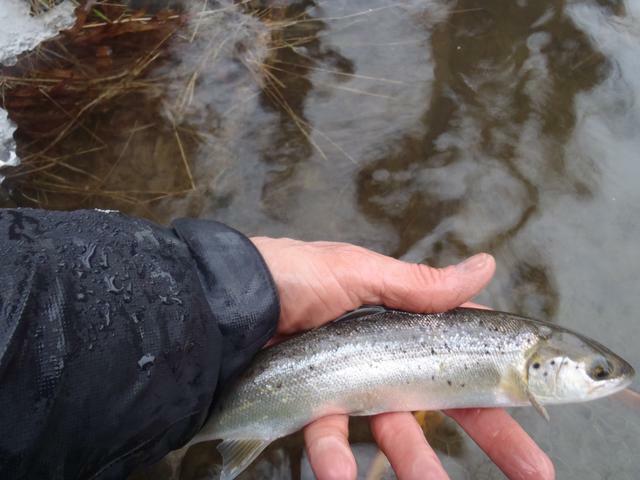 It seems like the few caught off the shore in Maine are mostly in flowing water as dropdowns from lakes. It would be really neat to get an open water lake trout this time of year! Yeah down in MA they have a few reservoirs they catch the lakers from shore at, but in NH it’s pretty much ice fishing and trolling. I did see a giant lake trout at a trib on lake winnipesaukee years ago under a bridge. 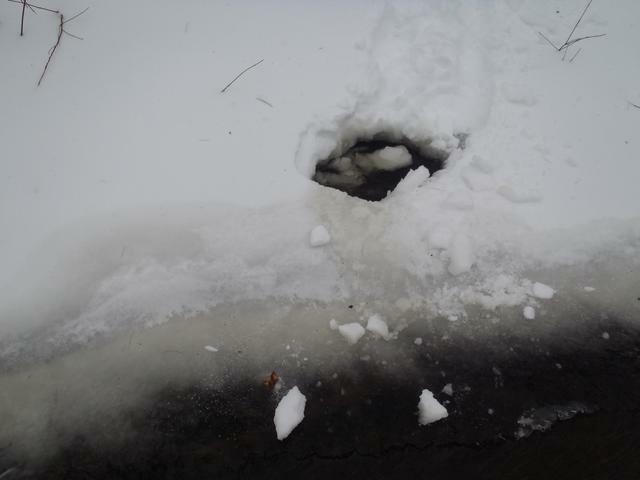 It was there for 3 hours at least, and wouldn’t budge one inch for anything that drifted by. Quite impressive to see in comparison to the salmon and bows all around it. 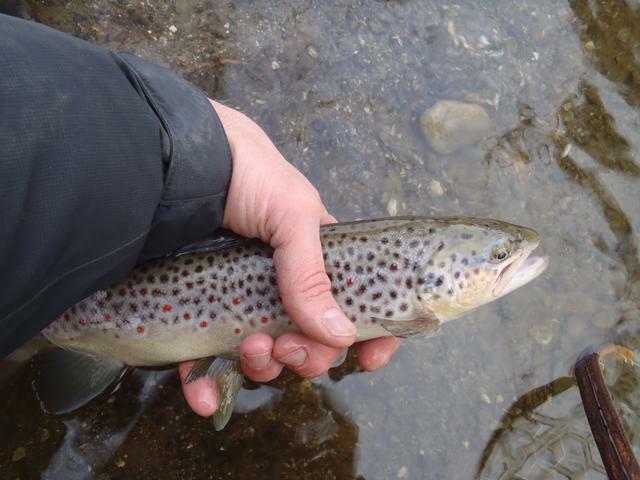 really like Brown trout #1, looks like a decent sized one? Thanks, Randall. 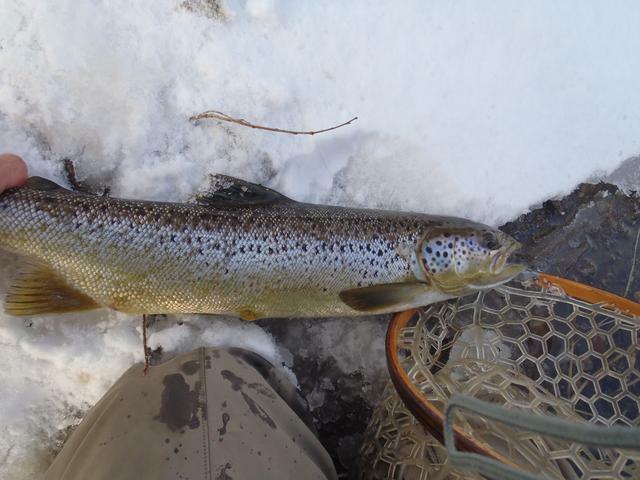 The biggest brown is just over 18". As good as January was, you know that the rest of the winter could be tough and give a meal of humble pie. As most of us who have been around a while know, the first several days into February can only mean one thing......Jim's January recap! This thread was considerably more entertaining than last night's game and halftime show combined! Congrats on a successful January, Jim! No question you have it down to a science. Very informative post, thank you for sharing. Awesome stuff Jim! All of those fish are beauties.